The MEDIS project will strengthen and consolidate social cohesion, intercultural education and local language in a multilingual framework of newly arrived migrants at primary and secondary schools through the Mediterranean Inclusive Schools Programme in 6 European countries (Spain, Cyprus, Greece, Italy, Portugal and Bulgaria). The programme will adapt teaching skills and inclusive methodologies needed by the educational community: teachers and other pupils. MEDIS project has the ambition to evolve to a common framework for actions in order to develop more inclusive societies, starting from schools and proposing a solution for the existing linguistic and cultural barriers faced in the learning system. 15th of June 2018 | organised by Municipality of Maçanet de la Selva, Secondary School of Maçanet de la Selva and WUSMED in Girona in collaboration with the Department of Education of the Catalan regional government. In Catalonia there is currently a moderate immigration, and the focus is now also on second generation immigrants and on internal migration. The legislative framework is inclusive, and all underage immigrants are being educated for at least 16 years. The educational centers that have prioritized the attention of immigrant pupils in reception classrooms to teach them the local language before entering the ordinary classrooms have very positive results at the level of social inclusion. Also, the centers that have implemented their own projects framed in the autonomy of the center, that work curricular contents through transversal projects of cohesion, show positive results. Lastly, the execution of community-based projects in which educational centers make an educational network with the municipal agents, such as the educational environment (PEE), show very satisfactory results at the level of social inclusion. 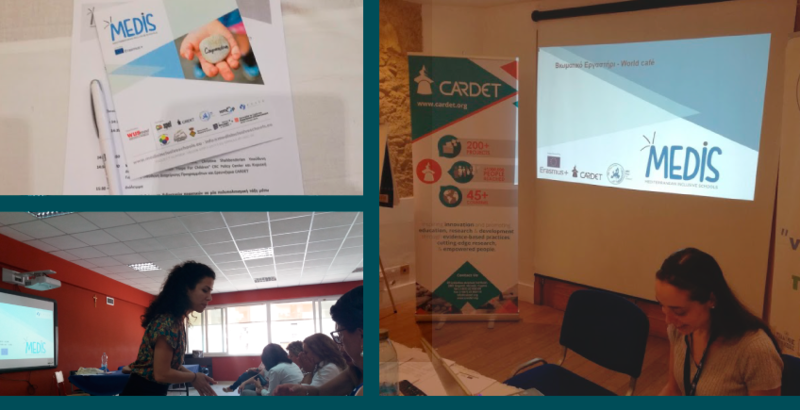 21st and 28th of June 2018 in Nicosia, Cyprus | organised by the International Research Centre CARDET in collaboration with the “Hope For Children” CRC Policy Centre organized two different dissemination events in order to promote the activities of the MEDIS program. The world café format helped the all participants (educators, school teachers from primary and secondary schools, adult educators and school leaders) to start their active participation in the MEDIS activities and exchange the ideas, doubts and needs of the different stakeholders to achieve the development of a more inclusive society focused on the primary and secondary schools. 21st June 2018 in Sofia, Bulgaria | organised by the Regional Department of Education Sofia City and Know and Can association Together with representatives of primary and secondary schools, regional government and non-governmental representatives was discussed how to develop a more inclusive environment for migrant students in schools, support teachers in multicultural classes, equip educators with various means to deal with the existing linguistic and cultural barriers and create a more receptive environment in schools in particular and society in general. Schools and other relevant stakeholders do their best to assure a successful inclusion of immigrants, however there is a clear need on the different levels to develop new strategies, methodologies and skills regarding the inclusion of migrant students. Additionally, it is needed to acquire knowledge about the culture and language of migrant students and to deal with the emotional and psychological constraints of these students. 3rd July 2018 | organised by CESIE in Palermo, Italy in collaboration with School Regional Office Sicily. A good practice identified as the main ‘box’ capable of containing other good practices is the elaboration of an integrated reception plan, either at municipal and at educative/school level. The idea is that the newly arrived migrant families could obtain some basic information on the access and availability of the basic services existing at local level (including also the educative offer for their children). After the first project phase focused on the assessment of the needs of school educators in view of the actual challenges, several workshops with school educators and the collection and analysis of complementary Good Practices implemented by the participating organisation we are currently working on the first version of the Handbook for the Mediterranean Inclusive Schools. In the following months we will constantly improve the MEDIS Handbook and offer a specific Capacity Building MEDIS Programme for the school educators. Follow us to discover more about the MEDIS Handbook, Capacity Building programme and the series of pilots planned to start in 2019. We want you to join us! OUR NEXT MEETING: Consortium meeting Athens, Greece, 3rd and 4th of September 2018.